Our intruder alarm systems are designed and installed to conform with the current regulations EN50131 which supersedes IS199. We no longer hold a licence but can sub contract these services. While there is a vast range of equipment and brands available for use on the market we recommend the use the same old reliable equipment all the time; that is the HKC brand. HKC is an Irish company with local knowledge and back up and there is always a good supply of stock in the wholesalers which leads to a good service to you the end user. Equipment for the detection of break-ins or attempted break-ins may seem to have technical names or descriptions so we have detailed below the names and exactly what the equipment is used for so you can compare like with like if you are shopping around for quotes. Combined Sensor/MC Contact; This equipment detects a forced entry or an opening of a protected window or door. Contact; This equipment detects the opening of a protected window or door, but does not detect the smashing or breaking of a window or door. Inertia Sensor; This equipment detects a forced entry into a protected window or door. Panic Button: The panic button would normally be placed at the hall door or the main bedroom at or near the bed location, the button may be pressed in a duress situation. Motion Detector or PIR; This is a Passive Infra-Red movement detector which will activate upon detecting movement within the protected area, they are normally placed in a hallway. 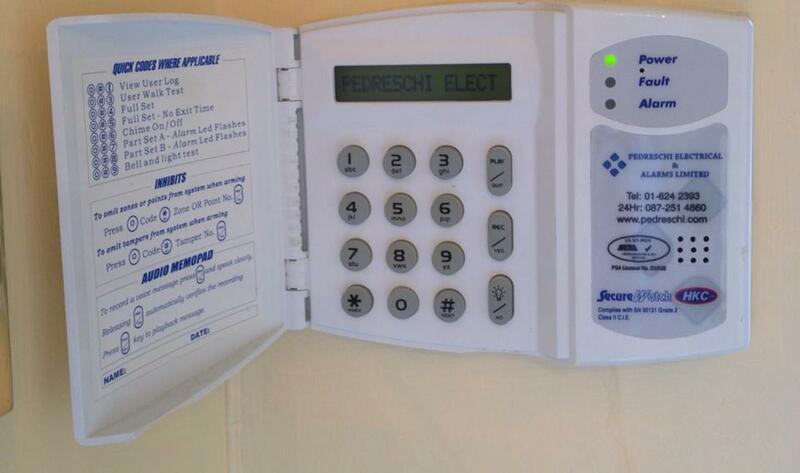 Remote Key Pad or RKP; This is a key pad which allows the user to switch the system on or off by entering your code. External Bell Box or SABB; This is the outside bell box which contains a standalone battery, the strobe lights and sounder, it is tamper-proof and we normally set this to a cut off after a certain period of time, when it will reset and activate again upon further detection. Internal Sounder; This is the internally located siren which will ring upon an activation, again we normally set this to a cut off after a certain period of time, when it will reset and activate again upon further detection. This can be a sound only unit or a sound and visual unit for those with impaired hearing. Communicator: The inclusion of a communicator in the system will allow the system to send on a message to an external body that the system has activated the monitoring station would then take appropriate action, there would be an annual charge associated with this and would be paid directly to the monitoring station.